Stevia is a blanket term for all sweeteners derived from the Stevia rebaudiana bush, which is prevalent in Asia and South America. Sweeteners labeled stevia are actually extracts called steviol glycosides. 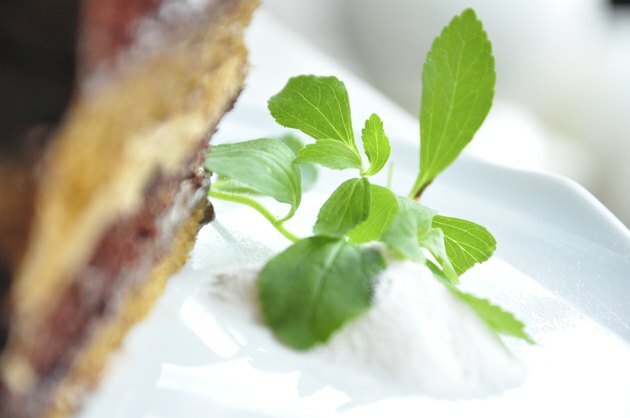 The two primary steviol glycosides are rebaudioside A and stevioside, both of which are 200 to 300 times sweeter than sucrose, contain zero calories per serving, and are relatively safe for human consumption. Stevia sweeteners represent about 40 percent of the sugar replacement sweeteners used in Japan. For many years, the FDA banned the use of stevia as a sweetener in soft drinks and only allowed it to be sold as a dietary supplement. At that time, stevia carried a recommended dosage of up to 2 mg per kilogram of bodyweight daily. In 2008, the World Health Organization completed a substantial safety study on steviol glycosides and determined that they are safe to eat in volumes up to 4 mg per kilogram of bodyweight per day. A tolerable upper limit for stevia, or the amount you can consume daily without experiencing side effects, is not well established. The American Dietetic Association reports that some studies of diabetics using rebaudioside A have given subjects doses as high as 15 mg per kilogram of bodyweight a day without any adverse side effects developing. Other studies examining the effects of stevia on blood pressure saw subjects safely consuming up to 1,500 mg daily. The New York University Langone Medical Center states that 750 mg of stevia is equivalent in sweetness to 1/3 lb. of sugar, and is far more stevia than you are likely to consume in a day. In 2008, researchers at the University of California, Los Angeles completed a toxicology review for the stevia sweetener rebaudioside A as a part of the FDA’s generally recommended as safe, or GRAS, review for the product. The researchers concluded that rebaudioside A does not adversely affect blood flow or cause cancer. However, the team did find mutagenic properties in some extracts of the stevia sweetener, and advised the FDA to conduct further research before granting GRAS status. The FDA moved ahead with GRAS status for the stevia sweetener despite some advocacy groups demanding further testing for DNA altering from these sweeteners. It is relatively safe for you to consume stevia as a replacement for sugar in your normal diet. New York University reports that consuming very high doses of stevia have been shown to cause a significant drop in blood pressure. This could theoretically be dangerous, though these drops were only associated with doses of stevioside much higher than what a person would normally use in their diet. Young children, pregnant or nursing women, people with liver disease or those with cardiovascular conditions should only consume stevia under the advisement of a physician.